The team of world-renowned dermatologists at Cosmetic Laser Dermatology in San Diego are pleased to be the home of the FIRST PicoSure Laser in Southern California and the only practice in San Diego with PicoSure! Picosure is one of the newest advancements in cosmetic laser technology. This laser has been proven time and time again as one of the most revolutionary treatments available for the quick and easy removal of unwanted tattoos and non-cancerous skin pigment problems. Unlike other laser treatments responsible for improving similar skin problems, picosecond technology allows for improved results like never seen before. Though most lasers work by delivering quick pulses of light energy into a targeted area of the skin, the PicoSure system pulses at an astonishing rate 100 times shorter than nanosecond technology. This allows for an unparalleled photochemical impact, resulting in fewer treatments for the patients and a faster rate of skin clearance. 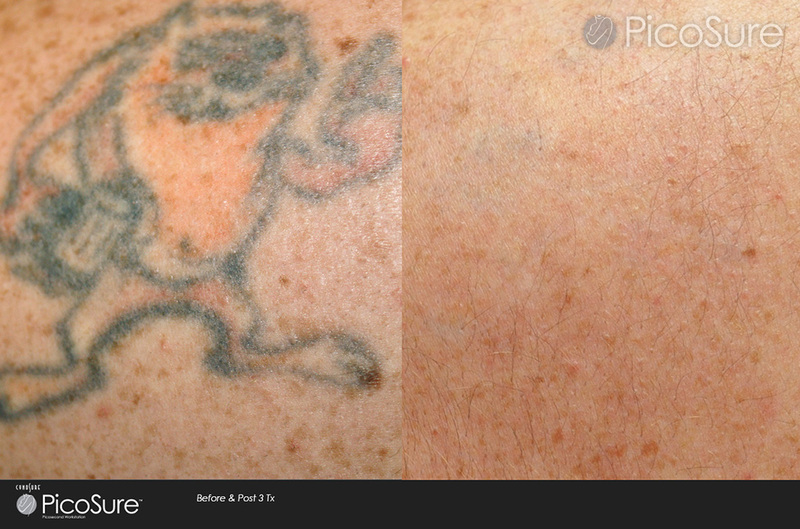 In a study done by the Laser and Skin Surgery Center of New York, 22 individuals with multicolored tattoos received treatments with the PicoSure laser system over a two week period. In this short time frame, patients reported their tattoos to be more than 80% clear, with typically difficult blue and green ink showing a clearance of 94%. 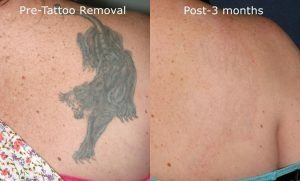 picosure.com has more information about how effective this laser is for tattoo removal. Q: How does the laser work? A: This innovative laser treatment works to target specific areas of the skin to remove tattoos or other pigment problems. Because it uses a shorter pulse duration than other systems, treatment can be performed much more efficiently and results in very optimal outcomes for patients. Q: How many treatment sessions are needed? A: On average, 3-10 sessions may be needed however this will depend on size, color, density and location. In a recent study, those who underwent treatment noticed an 80% skin clearance after only two weeks. Until our San Diego dermatologists are able to examine you in person, it’s difficult to determine how many sessions will be likely to bring you the best results possible. 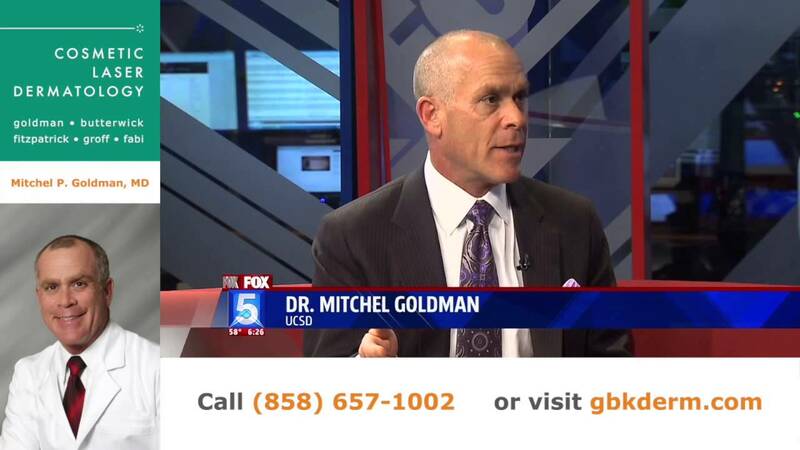 Q: Who should perform cosmetic laser treatments? A: It’s always important to make sure that you visit a board certified dermatologist for all laser skin treatments. A board certified dermatologist has the greatest understanding and knowledge in the performance of laser surgeries and understands how to bring the best results to patients. This also lowers the patient’s risk of receiving any permanent damage. Q: Am I a good candidate to undergo PicoSure? A: You might be an excellent candidate to undergo treatment with picosecond laser technology in San Diego if you wish to remove a tattoo located anywhere on your body, or if you are experiencing benign pigmented lesions. To further determine your candidacy, please contact our office today to schedule an initial consultation with a board-certified dermatologist and cosmetic surgeon. Q: Is the PicoSure laser FDA approved? A: Yes, it is FDA approved. In fact, the laser received clearance from the FDA in December of 2012. This means the treatment is not only safe, but effective for the right individuals. Q: Can it treat post inflammatory pigmentation problems and melasma? A: We are presently doing a study at our practice to determine if picosecond laser technology will work for melasma. If one has type V or VI skin I would still be very cautious as this is a 755nm wavelength that can target pigment very effectively. Hopefully a picosecond 1064nm laser will allow us to treat types IV-VI more safely in the future without such a great risk of targeting their normal pigment. Q: Does it have the ability to target red and yellow ink? A: In studies the PicoSure was great at removing most colors, even yellow. So although it is a 755nm wavelength and should really only target black, green and blue, the speed at which it delivers the energy is photo-acoustically breaking up the pigment. Nonetheless, in the initial trials red was not as effectively targeted. We have the device, and are always happy to do a free consultation to provide pricing. Q: Is it good for the removal of black tattoos? A: The PicoSure laser in San Diego has shown to more effectively and rapidly treat this color tattoo than the conventional Q-switched lasers and in less treatment settings. Q: How much does PicoSure cost? 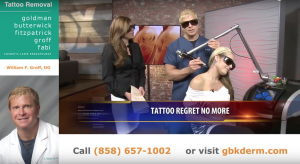 A: The cost of your laser tattoo removal treatment in San Diego will depend on a variety of factors including the size, color, and placement on the body. We offer free consultations with a board-certified dermatologist to determine the best treatment plan for you. Contact our office to schedule your appointment today. 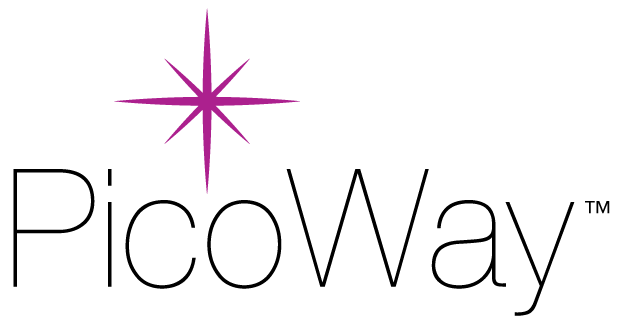 In addition to Picosure, Cosmetic Laser Dermatology’s pigmentation specialists offer the PicoWay for laser tattoo removal. When our world-renowned experts are able to examine you in person, we’ll be able to develop a customized treatment plan with either PicoSure or PicoWay that will provide you with the best results.